A Limited Disclosure Nuclear Agreement with Iran: Promise or Peril? With negotiations between Iran and the P5+1 (the five permanent members of the UN Security Council, plus Germany) over the fate of its nuclear program appearing to lose steam, the Obama administration is floating a radical new proposal to break the deadlock. Already prepared to let Iran retain sufficient enrichment capacity to produce the fissile core of a bomb in as little as six months and no longer insisting that it dismantle excess centrifuges or close a subterranean enrichment bunker purpose-built to withstand air attacks, Washington is now willing to relax the once inviolable demand that Iran come clean about past illicit nuclear activities. For years, the Islamic Republic has adamantly refused to account for what the International Atomic Energy Agency (IAEA) calls the "possible military dimensions" (PMD) of its nuclear program, specifically an array of research and development work the international watchdog considers "highly relevant" to producing the non-fissile components of a nuclear weapon (e.g. experiments with exploding-bridgewire detonators). Though Western intelligence agencies say that Iran had a secret weaponization project at least until late 2003, Iranian officials maintain that no such project ever existed, while denying IAEA inspectors access to key sites and personnel. Prior to the signing of an interim nuclear agreement last November, it was commonly understood in Washington that Iran must "come clean about the possible military dimensions of its nuclear program," as Under Secretary of State for Political Affairs Wendy Sherman, the lead U.S. negotiator in six rounds of talks with Iran, told the Senate Foreign Relations Committee in December 2011. There are five compelling reasons why full disclosure has long been seen as a prerequisite for any comprehensive settlement of the nuclear dispute. First, as Institute for Science and International Security (ISIS) President David Albright and Bruno Tertrais emphasize in a recent Wall Street Journal op-ed, a full accounting of PMD flagged by the IAEA is necessary to quantify Iran's breakout time – how long it would take the country to produce a bomb in the event that it reneges on a prospective agreement. Iran's breakout time is currently two months to produce sufficient weapons grade uranium, plus whatever extra time is needed to build the mechanical components of a bomb – estimated to range from a few months to a year. While the former can be extended by limiting the number and types of centrifuges Iran can readily put into operation and capping the amount of low enriched uranium it has on hand to use as feedstock, the second variable is an unknown constant (i.e. the terms of a final status agreement won't change how close Iran is to mastering the mechanics of building a nuclear weapon). So long as the latter is unknown, the international community cannot be sure of how much lead time it will have to thwart an Iranian breakout in progress. Second, as Washington Institute for Near East Policy managing director Michael Singh has frequently interjected, Iranian transparency about past deceptions is critical to the IAEA's ability to uncover future deceptions. If Mohsen Fakhrizadeh, the scientist in charge of many of Iran's illicit research projects, were to walk into IAEA offices tomorrow and speak truthfully about the who, what, and where of these weaponization efforts, it would be extraordinarily difficult for Iran to resume or continue the research later on without tipping off the outside world. That's precisely why the Iranian government has blocked access to him. If Iran is truly committed to a wholly peaceful nuclear program, it has nothing to fear from transparency. Third, as Emily B. Landau and her colleagues at Tel Aviv University's Institute for National Security Studies (INSS) maintain, an Iranian mea culpa will further legitimize the special constraints imposed on its nuclear program in the eyes of the international community, making it much easier to mobilize support for multilateral sanctions in the event of future transgressions (the "I know what you're thinking ..." routine won't work anymore). Fourth, even an oblique Iranian acknowledgement of past weaponization activities would underscore to the Iranian people that the years of stifling international sanctions they have endured were based on legitimate grounds, not what President Hassan Rouhani calls Western "scientific apartheid." This, in turn, will make it much harder for the regime to rally public support for future defiance on the nuclear issue. Finally, for all of these reasons, insisting on full disclosure provides a critical test of Iranian intentions. If Iran is truly prepared to commit itself to a wholly peaceful, civilian nuclear program, it has nothing to fear from transparency. Indeed, erasing doubts about its checkered past as definitively as possible would be essential to the program's success, which hinges on access to outside technology and nuclear fuel supplies. If, on the other hand, Iranian leaders intend to violate the agreement and resume working on a bomb when international conditions are more permissive, avoiding full disclosure is mission critical. Not surprisingly, P5+1 demands for full transparency hit a brick wall when negotiations over a final status agreement began in earnest early this year. The Iranians have refused even to acknowledge having had a weaponization program, let alone disclose how close they came to mastering the mechanics of building a bomb and other relevant details. Rather than give the Iranians an ultimatum, however, American and European diplomats have come to "recognize how awkward it is for Iran to admit to such things," according to the Economist, and are prepared to "cut it some slack if it deals with everything else." Sherman, who previously insisted that Iran come clean about its weaponization program, now maintains that "the possible military dimensions of the Iranian nuclear program" will merely "have to be addressed in some way." Meanwhile, analysts close to the Obama administration are openly pitching the limited disclosure option. Though none have yet offered a rigorous elaboration of the argument, their reasoning is centered on two propositions. The first is that full disclosure isn't necessary for effective monitoring of the Iranian nuclear program. If "monitoring arrangements can provide strong confidence in compliance going forward," writes Robert J. Einhorn, who served from 2009-2013 as then-Secretary of State Hillary Clinton's nonproliferation advisor, "then the requirement for detailed information about all past activities need not be quite so demanding." Likewise, Jofi Joseph, a senior nonproliferation expert on the National Security Council until last year, argues that complete transparency isn't needed to "ensure that Iran, whatever it may have done in the past, is not proceeding today with weaponization activities in the future" (whatever this convoluted phrasing means). How such an omniscient monitoring regime can be put in place without unfettered Iranian cooperation is left largely unexamined. The second proposition is that the demand for full disclosure can be "traded away for progress in other arenas," in the words of Jon Wolfsthal, formerly Vice President Joe Biden's special advisor for nuclear security and nonproliferation. Insisting on complete transparency "jeopardizes what's really important, which is making sure Iran's production of fissile material is severely constrained," says Joseph. However, even if the Iranians become more amenable to compromise in "other arenas" in exchange for not having to come clean on weaponization (and there is certainly no sign of it yet), an agreement relieving Iran of responsibility to tell the truth isn't likely to inspire much international confidence that the nuclear threat has been mitigated. Although the precise details of what the Obama administration has in mind are not entirely clear, a prospective agreement would likely include an ambiguous Iranian commitment to satisfy IAEA concerns about past activities, while leaving the question of whether Tehran has done so wholly up to the IAEA, with some kind of informal understanding that honest answers to certain questions will not be expected. Sherman alluded to this buffer in February, telling a news conference in Israel, "The more Iran can do with the IAEA, which is where this belongs, the more likely we will have a comprehensive agreement." Few trust the IAEA to cry foul should Iran fail to meet even the limited disclosure requirements of an agreement. But few trust the IAEA to cry foul should an otherwise cooperative Iran fail to meet even the limited disclosure requirements of such an agreement. Just days after Sherman's remarks, it was revealed that the IAEA had recently shelved a report with new PMD details for fear that it would have "reinforced the concern" about Iran during the delicate negotiations, a source familiar with the matter told Reuters. Indeed, the IAEA should already be crying foul. Although Iran promised to quietly work toward resolving IAEA concerns after signing the interim agreement last November, the Associated Press reported in mid-May that the IAEA was "no nearer to closing the books" on its suspected weaponization projects. Indeed, according to Albright, Iran has "elevated the level of its effort to dissemble." Proponents of limited disclosure are right about one thing – insisting on full transparency may well jeopardize the progress of the negotiations. But this is not, as many suggest, because Iranian leaders would be too embarrassed or humiliated at home by having to admit lying to their people. To be sure, coming clean will be awkward given that Supreme Leader Ayatollah Ali Khamenei issued a religious decree (frequently cited by Iranian officials in English-language interviews ever since) calling the acquisition of nuclear weapons un-Islamic. But the suggestion that years of lying make it "virtually impossible for [Iran] to own up to any illicit work" is nonsensical. There are plenty of ways for Iran minimize the domestic political fallout of transparency about past weaponization efforts. Gary Samore, the chief White House advisor on weapons of mass destruction during President Obama's first term, suggests that Tehran can employ "useful fiction" to spin sensitive acknowledgements, such as attributing illicit weaponization research to rogue scientists. President Rouhani could use the admissions to present Iran as a pioneer for the cause of global nuclear disarmament. If Iranian leaders continue to reject substantive transparency, it isn't because they can't spin it. It is because they have not yet abandoned their ambition to produce a nuclear weapon or relegated it squarely behind the pursuit of more responsible public policy goals. Cutting them some slack won't change that. Gary C. Gambill is a Shillman-Ginsburg fellow at the Middle East Forum and frequent contributor to the National Post, FPRI E-Notes, the Jerusalem Post, Foreign Policy, and the National Interest. He was formerly editor of Middle East Intelligence Bulletin and Mideast Monitor. "Highlights in U.N. report on Iran nuclear program," Reuters, November 8, 2011. Wendy Sherman, Statement Before the Senate Foreign Relations Committee, Washington, DC, December 1, 2011. "It is critical to know whether the Islamic Republic had a nuclear-weapons program in the past, how far the work on warheads advanced and whether it continues," they explain. "Without clear answers to these questions, outsiders will be unable to determine how fast the Iranian regime could construct either a crude nuclear-test device or a deliverable weapon if it chose to renege on an agreement." See "Making Iran Come Clean About Its Nukes," The Wall Street Journal, May 14, 2014. Western diplomats and nonproliferation experts cited by Reuters concur that full disclosure of PMD is "important in being able to quantify the time Iran would need to dash for a nuclear weapon." See "Exclusive: U.N. nuclear agency opted against sensitive Iran report – sources," Reuters, February 27, 2014. "Without insight into the full extent of Iran's clandestine nuclear activities, no amount of monitoring and inspection can provide true confidence that Iran lacks a parallel program beyond inspectors' view," according to Singh. See Michael Singh, "Answers to key questions will determine Iran deal's success," The Washington Post, November 25, 2013. "U.N. nuclear report puts Iran "mystery man" in spotlight," Reuters, November 11, 2011. Emily B. Landau, Ephraim Asculai, and Shimon Stein, "Atomic Amnesia: The Forgotten Military Aspects of Iran's Nuclear Program," The National Interest, June 3, 2014. Arash Karami, "Rouhani says 'We will not accept scientific or nuclear apartheid'," Al-Monitor, May 12, 2014. Rouhani's use of the expression is not new. See "Iran slams 'West's scientific apartheid'," Press-TV (Tehran), November 11, 2010. "Moving ahead," The Economist, May 17, 2014. 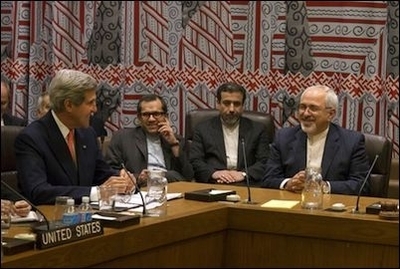 "U.S. diplomat in Israel: Iran deal will permit 'monitored, verified' enrichment program," Haaretz, February 22, 2014. Robert J. Einhorn, "Preventing a Nuclear-Armed Iran: Requirements for a Comprehensive Nuclear Agreement," The Brookings Institution, March 2014. "Should Iran get a pass on explaining its nuclear past?" USA Today, May 19, 2014. Jon Wolfsthal, "Uncovering Iran's Nuclear Past: Where to Start? Where to Stop?" The National Interest, May 24, 2014. Remarks by Wendy R. Sherman, U.S. Department of State, February 22, 2014. Italics added for emphasis. "U.N. nuclear agency opted against sensitive Iran report – sources," Reuters, February 27, 2014. "UN's nuclear probe of Iran falters," The Associated Press, May 12, 2014. David Albright and Andrea Stricker, "Spin, Spin, Spin – Rev. 1," Institute for Science and International Security, May 27, 2014. Fredrik Dahl, "Is Iranian bomb research "mea culpa" needed for nuclear accord?" Reuters, May 14, 2014. Quoted in "UN's Nuclear Probe Of Iran Falters," The Associated Press, May 12, 2014.